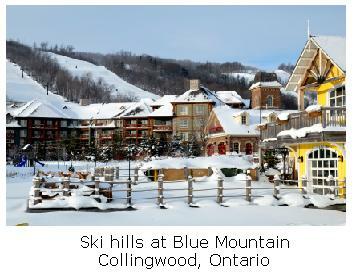 Today, Collingwood is known as a resort town for all seasons, with great skiing, snowmobiling and for its close proximity to Wasaga Beach on Georgian Bay. In the days before the arrival of European settlers, this area of Southern Ontario was inhabited by the Iroquoian Petun Nation who built their villages in the area. They were driven out by the Iroquois in 1650 who were themselves later displaced by European settlers and freed slaves from the US who arrived here in the mid 19th century, and who brought with them their language and religion. In 1858 the town was incorporated as a town and was named after Admiral Lord Cuthbert Collingwood, who was second in command under Horatio Nelson at the Battle of Trafalgar. In 1855 the railroad, in the form of The Ontario, Simcoe & Huron Railway came here and the harbour became the shipping point for the many goods which were heading to the upper Great Lakes - Chicago and present-day Thunder Bay. As many ships were passing through, and needed repairs, this town became well known for both ship repairs and for ship building. In 1883 the Shipyards here opened and for many years produced ships for commercial shipping, and also for the Royal Canadian Navy. 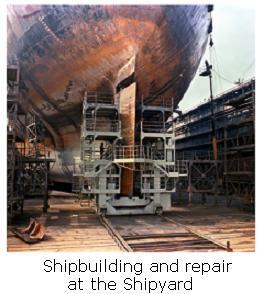 At its peak, shipbuilding employed 10% of the town's labour force. The industry declined in the latter half of the twentieth century, due to overseas competition, resulting in it's demise in this town in 1986. Today, there are a variety of industries and businesses to its credit, including Ethanol production, Pilkington Glass, the Goodall Rubber Company, C F Crozier & Associates (Engineering), and the Canadian Mist Whiskey distillery. This town is currently famous for the wonderful skiing that is available here at Blue Mountain , which is well known in Southern Ontario. When we go to Collingwood, we stay at the Georgian Manor Resort which is located on Vacation Inn Drive. This lovely vacation spot is luxurious and is a great base for travelling this area of Ontario. 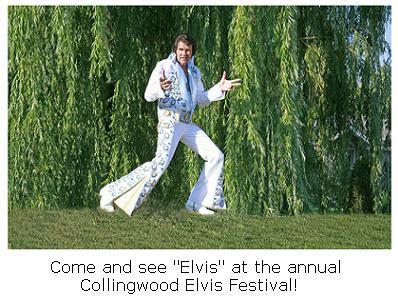 One annual event that we mustn't forget to tell you about is the Elvis Festival - what a fabulous time we had there! Tickets may be purchased on-line through their website.